A group by the name of Stand for Tenant Safety, consisting of tenant groups and eleven City Council Members (including Rosie Mendez from the Lower East Side, Stephen Levin from Williamsburg, and Antonio Reynoso of Bushwick) rallied on the steps of City Hall this morning. Never mind the rain. The coalition is named for a new report, released today by the Urban Justice Center, that coincides with the introduction of a legislation package that would protect tenants from landlords and developers who carry out neglectful and malicious construction projects. “My tenants have rain coming down in their apartments, so this is nothing,” said CM Rosie Mendez of the Lower East Side. Airbnb officials went head to head with City Council members at a committee hearing Tuesday morning, defending the right of its hosts to rent out their apartment even if it breaks New York State law. Protesters rallied against the development of Broadway Triangle in Williamsburg, saying the proposed housing heavily favors the Hasidic Jewish population over blacks and Latinos. But the property’s developer says it’s all the opposite: opponents of the affordable units are being anti-Semitic. The City Council passed a bill yesterday that would allow New Yorkers to set aside pre-tax pay for public transportation, potentially saving the average commuter hundreds of dollars a year. Just imagine how many Uber rides you could take with that, so as to avoid the miserable G train. 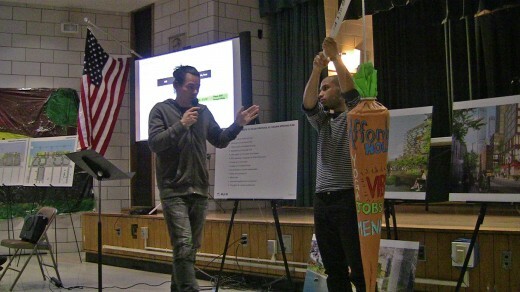 Friends and foes of the plan to redevelop the Domino Sugar refinery once again had their say last night — and what would a Williamsburg community board meeting be without papier-mâché?